On Saturday the 8th August Balbriggan Golf Club hosted their annual Captains Charity Day. The two beneficiaries were Balbriggan Meals on Wheels and Remember Us. On Saturday President of Balbriggan Golf club Michael Hough and Lady Captain Collette Guildea presented BalbrigganMeals on Wheels with a cheque for €2,300. Balbriggan Meals on wheels is a vital local service for people who for one reason or another are unable to cook for themselves. 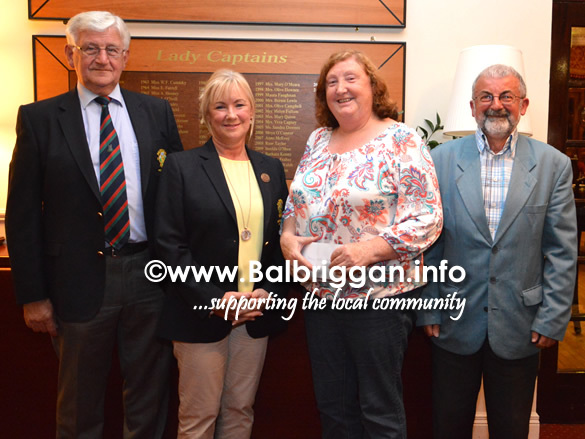 The service receives funding from the HSE for the part-time co-ordinator and a portion of the cost of meals but they have to raise the balance of funding themselves so the monies raised at the Balbriggan Golf Club Captains Charity Day will be a big help.